In time for the 32nd year of the EDSA People Power 1, members of Movement Against Tyranny – Metro Manila, Bayan Metro Manila, Rise Up for Life and for Rights – Metro Manila, People Surge and Stop The Killings Network held a wreath-laying and candle lighting ceremony at the historic Don Chino Roces Bridge in Mendiola, Manila today. According to the groups, Mendiola was the site of countless anti-Marcos protests. From the First Quarter Storm of 1970 to the storming of the Palace in 1986, Mendiola came to symbolize the people’s quest for the return of democracy. They also placed flowers and photos of martial law activists and martyrs at the barricades in Mendiola as tribute to the real heroes of the EDSA People Power. “The barbed wires of Mendiola and the steel barriers protecting the Malacanang Palace reflect the continuing great divide in the nation. 32 years after EDSA, our situation remains the same: poverty and inequality persist, democracy is under attack, and our rights are violated with impunity,” said Mong Palatino, chairperson of Bayan Metro Manila and convenor of Movement Against Tyranny Metro Manila. The groups denounced the various “anti-people” policies of Duterte including his drug war, Charter change, martial law in Mindanao, curtailment of press freedom, crackdown on activists, killings of farmers and government critics, TRAIN Law among many others. “Never again. Not in our lifetime will we allow another despot to curtail our rights and destroy the future of our country,” Palatino ended. 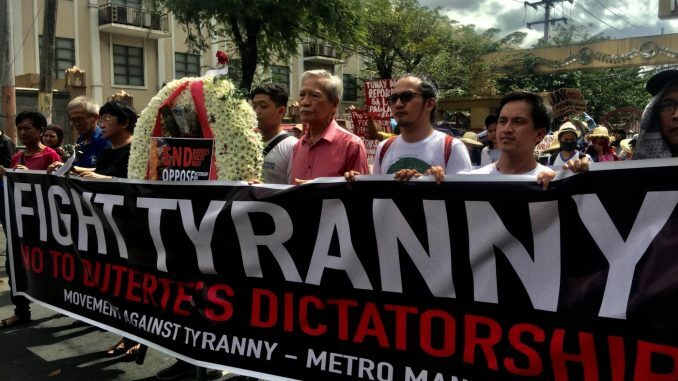 The post #EDSA32: Groups, martial law veterans say “never again” to the return of dictatorship appeared first on Manila Today.